The Biosciences eastern and central Africa-International Livestock Research Institute (BecA-ILRI) Hub is set to be the centre for training and capacity strengthening in a new international One Health initiative. ILRI's state-of-the art biosciences hub will be used in the implementation of the GBP 7.7 million grant to University of Liverpool to increase capacity for ‘One Health’ research in the Horn of Africa. The One Health Regional Network for the Horn of Africa (HORN) project led by University of Liverpool brings together partners from Kenya, Ethiopia, Somalia and Eritrea. The program will deepen existing University of Liverpool and ILRI links, already well established through several joint UK Research Council projects. Livestock play a critical role in the economies of low- and middle-income countries where up to three-quarters of a billion of the poorest people rely on livestock farming and products to make a living. However, livestock also pose human health risks because their ability to transmit infectious diseases. The grant has been awarded by the Research Councils UK (RCUK) from the Global Challenges Research Fund (GCRF) Growing Research Capability call which aims to build upon research knowledge in the UK, and strengthen local capacity to address priority challenges in the developing countries. The project will start in October 2017 and will run for four years. June 30, 2017 marked the final day of the Animal Quantitative Genetics and Genomics training held by the Biosciences eastern and central Africa-International Livestock Research Institute (BecA-ILRI) Hub in Nairobi. The workshop was held as one of the BecA-ILRI Hub’s Africa Biosciences Challenge Fund (ABCF) program annual trainings in key skill areas. The increasing demand for animal protein in emerging economies in Africa presents opportunities to sustainably improve livestock productivity. A better understanding of quantitative genetics—the basis of traits controlled by multiple genes in livestock—underpins the development of more successful livestock breeding programs that could accelerate animal protein production and move Africa towards food security. For 10 days, 21scientists from national agricultural research systems (NARS) of 14 African countries—Benin, Burkina Faso, Burundi, Cameroon, Chad, Democratic Republic of Congo, Ethiopia, Ghana, Kenya, Nigeria, Rwanda, Somalia, Sudan and Tanzania—participated in the course that gave them skills to support their research in livestock improvement including: population and quantitative genetics, linear models, variance components, selection principles, breeding strategies, genome selection and implementation of statistical tools in animal breeding. Researcher Salome Shayo from Tanzania Fisheries Research Institute acknowledged the relevance of the workshop to fish breeding programs in Tanzania. Shayo is involved in research to improve the growth rate, survival, age at maturity, and carcass quality of tilapia fish, which will be produced by smallholder farmers in the country. ‘The knowledge I gained from the workshop has enabled me design a selective breeding program for improvement of tilapia production in Tanzania,’ said Shayo, who plans to start the breeding process with wild stock selected for genetic variation and heritability of traits of interest. Julius Hagan, a senior lecturer from the University of Cape-Coast in Ghana requested that the workshop be offered to an even broader pool of scientists as he considered the training to be beneficial and needed by so many African countries. The workshop was facilitated by: Raphael Mrode, ILRI principal scientist and professor in quantitative genetics and genomics at the Scotland Rural College; Samuel E. Aggrey, professor at University of Georgia’s Department of Poultry Science and Institute of Bioinformatics; and Romdhane Rekaya, professor at the University of Georgia’s Department of Animal and Dairy Science and Institute of Bioinformatics. The trainers are among BecA-ILRI Hub’s extended faculty comprising affiliated scientists drawn from institutions across the globe, which enables a broader scope of scientific advice, supervision and training through the ABCF program. On 27 June 2017, Andrew Campbell, chief executive officer of the Australian Centre for International Agricultural Research (ACIAR) visited the International Livestock Research Institute (ILRI) in Nairobi. As part of the visit, Campbell, who was accompanied by Mellissa Wood, ACIAR’s general manager for global programs, toured the Biosciences eastern and central Africa-ILRI (BecA-ILRI) Hub laboratory facilities. Among the highlights of the facilities tour were discussions with scientists from national agricultural research institutions who are currently research fellows at the BecA-ILRI Hub through the Africa Biosciences Challenge Fund (ABCF) program. Various governments and donor agencies—Australia, Bill & Melinda Gates Foundation, Sweden, Syngenta Foundation for Sustainable Agriculture, and the UK Department for International Development (DFID)—fund the ABCF program which provides access to high-end bioscience facilities, and hosts research by African scientists and their partners working to tackle key challenges to food and nutritional security on the continent. Through support to the ABCF program’s 2016 Advanced Genomics and Bioinformatics training workshop, ACIAR facilitated the training of four national crop breeders who are part of an initiative— Demand led plant variety design for emerging markets in Africa—is developing plant varieties suited to market demands in Africa. Campbell and Wood also visited the Integrated Genotyping Service and Support platform set up with funding from BMGF and implemented in partnership with Australian genotyping and information technology company, Diversity Arrays Technology Pty Ltd (DArT); held discussions with ILRI scientists involved in vaccine research and measurement of green house gas emissions in livestock production systems; and visited the ILRI bio-repository which provides long-term storage for biological material, as well as management of and access to associated data. The Biosciences eastern and central Africa-International Livestock Research Institute (BecA-ILRI) Hub has received USD 5.5 million to support the increased application of biosciences to boost agricultural productivity in the eastern and central Africa. The grant to the BecA-ILRI Hub has been awarded by the Swedish government through the Swedish International Development Cooperation Agency (Sida), for a period of five years starting from 1 July 2017. 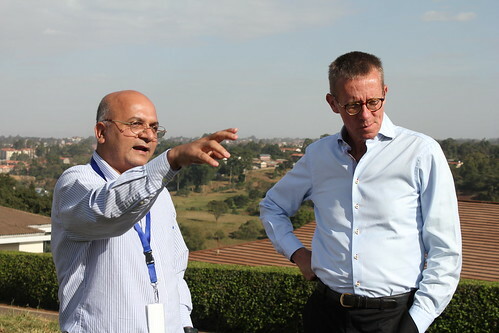 The support of the Government of Sweden to the BecA-ILRI Hub started in 2011. The resources were targeted to the development of a comprehensive mix of innovative research for development and capacity building activities under the food security program. Building on the successes of the food security program, Sida funded another program on Climate-smart Brachiaria grasses to increase livestock production in East Africa in 2012. This program is aimed at enhancing availability of quality forage for dry semi-arid lands and other agro-ecological zones of Kenya and Rwanda. ‘The BecA-ILRI Hub’s approach to research for development is consistent with the Swedish government’s strategy of creating synergies between research across different programs and with other development investments’. In 2013, Sida awarded a supplementary grant to the BecA-ILRI Hub that provided additional resources for research, capacity building and strengthening technology platforms of the BecA-ILRI Hub and three NARS institutions. This new support to BecA-ILRI Hub’s research, capacity building and technology platforms will facilitate the strengthening of existing partnerships with national agricultural research systems and other donor funded initiatives that are visibly contributing to the Comprehensive Africa Agriculture Development Programme (CAADP) agenda. The Biosciences eastern and central Africa-International Livestock Research Institute (BecA-ILRI) Hub held a two-week training workshop on Data Management and Genotyping by Sequencing (GBS) analysis from 5–16 June 2017. The focus of the workshop was to equip scientists with computational skills needed to manage and analyze GBS data. The training was offered in response to the needs of national agricultural research systems (NARS) scientists identified through various engagements with the BecA-ILRI Hub including annual workshops on Advanced Genomics and Bioinformatics in and Introduction to Molecular Biology and Bioinformatics. Twenty participants from nine African countries—Burundi, Ethiopia, Kenya, Madagascar, Nigeria, Rwanda, South Sudan and Uganda—had an opportunity to work through their GBS data under the guidance of facilitators from Earlham Institute, UK; Fathom Labs, Kenya; and Ohio State University, USA as well as bioinformatics research associates from the BecA-ILRI Hub. In this five-minute video, participants from different countries share how they hope to apply the skills they acquired from the workshop. 16 June 2017—A new initiative to speed up crop improvement in sub-Saharan Africa – Alliance to Champion the Acceleration of Crop Improvement in Africa (ACACIA) was launched today. The alliance has been established by founding members, the International Livestock Research Institute (ILRI) through the Biosciences eastern and central Africa-ILRI (BecA-ILRI) Hub in Kenya and the John Innes Centre (JIC) in the UK. Speaking at the launch, which took place at JIC-UK, the BecA-ILRI Hub director, Jacob Mignouna noted that the initiative will fast-track scientific strides being made by African scientists and their international partners to achieve food security and improve nutrition through sustainable agriculture. ‘This alliance will harness the strengths of the global scientific community, as well as the recent advances in technology to find lasting solutions to the challenge of food insecurity in Africa’ said Mignouna. ‘We hope to develop a cadre of UK scientists who have a deeper understanding of the agricultural challenges in Africa and can connect to African scientists to achieve significant impact through their expertise,’ said JIC director, Dale Sanders. Cristobal Uauy, JIC’s academic lead for international development and co-leader of ACACIA, stressed the importance of strong linkages with African National Agricultural Research Systems, CGIAR Research Centres and advanced international research institutions to advance the improvement of important African food crops. ‘Africa has a quarter of the world’s arable land, but generates only 10 per cent of global agricultural output,’ said ILRI director general Jimmy Smith. ‘The partnerships consolidated through ACACIA will strengthen access to tools for crop improvement for the ultimate benefit of smallholder farmers in Africa,’ he added. The establishment of ACACIA has been made possible through initial funding awarded to JIC by the Bill & Melinda Gates Foundation and by the UK’s Biotechnology and Biological Sciences Research Council (BBSRC). Activities carried out under ACACIA will build on achievements realized through financial support to the BecA-ILRI Hub from the Australian government, Australian Centre for International Agricultural Research (ACIAR), European Union, International Development Research Centre (IDRC), Swedish International Development Cooperation Agency (Sida), Syngenta Foundation for Sustainable Agriculture, UK Department for International Development (DFID), US Defense Threat Reduction Agency and the Wellcome Trust, UK. 14 June 2017: An ambitious project to increase the adoption rate of agricultural technologies and reduce the food insecurity burden in Africa was launched at the International Livestock Research Institute (ILRI) Nairobi Campus last week. The Innovations in Technology, Institutional and Extension Approaches towards Sustainable Agriculture and Enhanced Food and Nutritional Security in Africa (InnovAfrica) project is jointly coordinated by the Bioscience eastern and central Africa-ILRI (BecA-ILRI) Hub and the Norwegian Institute of Bio-economy (NIBIO). This four-year project will spearhead the implementation and promotion of innovations that have potential to sustainably increase agricultural productivity in Sub Saharan Africa. According to the Food and Agriculture Organization of the United Nations (FAO), sub Saharan Africa continues to have high levels of food and nutrition insecurity despite advances in agricultural research and provision of extension services. The low uptake of innovations by farmers has been cited as a barrier transforming farming from subsistence to a profitable activity. Speaking during the official opening of the five-day workshop marking the InnovAfrica launch, ILRI director general Jimmy Smith emphasized the need for the involvement of smallholder farmer right from the technology generation process. ‘If this project can turn ideas into solutions that add value from the customers’ perspective, then we will make a great contribution to food security search,’ said Smith. ‘Research that is supposed to benefit farmers is often carried out without ithe involvement of farmers,’ said Juvenal Musine, coordinator of the Federation of Farmers and Pastoralists of Rwanda (IMBARAGA). ‘We hope this project will integrate our indigenous knowledge into the new technologies,’ he added. InnovAfrica brings together a multidisciplinary team of experts from 16 institutions including African national agricultural research systems (NARS), CGIAR and international institutions, farmer group representatives and private sector partners. The project spans six African countries – Ethiopia, Kenya, Malawi, Rwanda, Tanzania and South Africa – and is funded under the European Union (EU) Africa Research and Innovation Partnership, a partnership between EU and the African Union. The BecA-ILRI Hub director Jacob Mignouna noted that partnerships and capacity building were at the heart of the project, which will use new approaches of extension services to increase smallholder farmers’ ability to adopt innovative agricultural systems. European Commission research programming and policy officer Agnieszka Romanowicz lauded the plans to support the practical application of research findings through multi-actor platforms. ‘What the EC would like to see from this project is the uptake of research products,’ said Romanowicz. The InnovAfrica project aims at improving food and nutritional security in Africa. This will be achieved by integrating sustainable agriculture intensification systems and innovative institutional approaches with novel extension and advisory services by enhancing capacity building and knowledge sharing in smallholder farming in sub-Saharan Africa (SSA). The project is funded by the EC under the Horizon 2020 program. 13 June 2017–The Gulu University vice chancellor Nyeko Pen-Mogi visited the Biosciences eastern and central Africa-International Livestock Research Institute (BecA-ILRI) Hub in Nairobi yesterday. Pen-Mogi was exploring opportunities to strengthen the capacity of the team charged with establishing and maintaining a USD 12 million biosciences research facility at the Gulu University, northern Uganda. ‘I want to ensure that my team is competent in operating and maintaining all the equipment that will be installed in the new lab,’ said Pen-Mogi, adding that he was pleased with the increased capacity of his staff who had already received training at the BecA-ILRI Hub. The partnership between Gulu University and the BecA-ILRI Hub begun in 2009 with support to the university in developing a proposal that earned the institution a grant to establish a bioscience platform to support the human medicine, veterinary medicine, plant science and basic sciences faculties of the university. To date, the Ugandan institution has benefited from a range of capacity building activities including research mentorship through the Africa Biosciences Challenge Fund (ABCF) fellowship program; training during the BecA-ILRI Hub annual training workshops; hosting special trainings on laboratory management. In 2014, a team from the BecA-ILRI Hub and ILRI engineering department provided technical support in installing the university’s bioscience platform. During his visit, Pen-Mogi met ABCF fellows from Gulu University currently conducting part of their research at the BecA-ILRI Hub including: Geofrey Kawube a lecturer investigating blast disease management in improved finger millet; and Godfrey Otim and Geoffrey Wokorach who are developing and validating a new diagnostic tool for detection and characterization of sweet potato viruses in East Africa. Dr Jacob Mignouna has been appointed director of the Biosciences eastern and central Africa-International Livestock Research Institute (BecA-ILRI) Hub. Mignouna assumes the helm from Dr Appolinaire Djikeng who has held the post since December 2012. A plant molecular breeder and geneticist by training, Mignouna brings to the BecA-ILRI Hub a wealth of experience in leading research and managing donors’ investments in agricultural research for development spanning Africa, Europe and USA. He has previously served as the director for technical operations at the African Agricultural Technology Foundation, and most recently as a senior program officer and senior regional advisor for West Africa at the Bill & Melinda Gates Foundation in Seattle, USA. The Biosciences eastern and central Africa-International Livestock Research Institute (BecA-ILRI) Hub is a shared agricultural research and biosciences facility located at and managed by ILRI in Nairobi, Kenya. It provides support to African and international scientists conducting research on African agricultural challenges and acts as a focal point for learning, interaction and strategic research — enabling collaborations in the scientific community to benefit African farmers and markets within the region. The Hub was established as part of an African Union/New Partnership for Africa’s Development (NEPAD) African Biosciences Initiative, which employs modern biotechnology to improve agriculture, livelihoods and food security in eastern and central Africa. ILRI is a member of the CGIAR Consortium. CGIAR is a global agriculture research partnership for a food-secure future. Its science is carried out by the 15 research centres that are members of the CGIAR Consortium in collaboration with hundreds of partner organizations. From 3–5 May 2017, the Biosciences eastern and central Africa-International Livestock Research Institute (BecA-ILRI) Hub hosted a workshop on Golden Gate technology for researchers from the Ethiopian Institute of Agricultural Research (EIAR), Hawassa University and Ethiopian Biotechnology Institute. The workshop aimed at familiarizing the researchers with the technology, which can reduce months or years of plant transformation work to a matter of days. The Golden Gate technology allows the rapid assembly of DNA constructs that contain multiple desirable genes, ready for transformation and testing in plants. The platform at the BecA-ILRI Hub was established with support from the John Innes Centre (JIC) in May 2015. Andy Breakspear and Christian Rogers of JIC conducted the workshop, with support from BecA-ILRI Hub’s Leah Kago. As part of this capacity building programme, the BecA-ILRI Hub will hold a two-week training workshop on Data Management and GBS analysis from 5–16 June 2017. The first week of the workshop will focus on project organization, data management, data analysis, interpretation and visualization of various types of Next Generation Sequencing (NGS) datasets. The second week will cover Genotyping by Sequencing (GBS) data analysis and interpretation. We are seeking applicants who require skills data management to support their research, priority will be given to participants who have NGS datasets, especially SNPs data. Researchers who are currently engaged in agricultural research within a national research organization or university are highly encouraged to apply. Diversity analysis using TASSEL, R/RStudio, Structure. A team of facilitators from the Ohio State University, USA; Earlham Institute, UK; collaborating CGIAR Centers and the BecA-ILRI Hub will conduct the training sessions. A national of one of the following BecA countries: Burkina Faso, Burundi, Cameroon, Central Africa Republic, Congo Brazzaville, Democratic Republic of the Congo, Ethiopia, Equatorial Guinea, Eritrea, Gabon, Ghana, Kenya, Madagascar, Rwanda, São Tomé and Príncipe, Senegal, Somalia, South Sudan, Sudan, Tanzania and Uganda. Applicants from other African countries may be considered. Currently engaged in biosciences research and having NGS data, especially SNPs. *Please note that a letter of nomination/recommendation from head of department or home institution head is required. The training workshop will be held at the BecA-ILRI Hub located within the ILRI Campus, Nairobi, Kenya. BecA-ILRI Hub is a shared agricultural research and biosciences platform located at and managed by ILRI in Nairobi, Kenya. The platform increases access to world-class laboratories for African and international scientists conducting research on African agricultural challenges. The BecA-ILRI Hub’s mission is mobilizing bioscience for Africa’s development, by providing a centre for excellence in agricultural biosciences. This enables research, capacity building and product incubation, conducted by scientists in Africa and for Africa, and empowers African institutions to harness innovations for regional impacts in improved agricultural productivity, income, and food and nutritional security. Appolinaire Djikeng has been appointed director of the Centre for Tropical Livestock Genetics and Health (CTLGH), a partnership between the University of Edinburgh, Scotland’s Rural College (SRUC) and the Africa-based International Livestock Research Institute (ILRI). Djikeng who is currently director of the Biosciences eastern and central Africa- (BecA)-ILRI Hub in Nairobi, has also been appointed to a new Chair in Tropical Agriculture and Sustainable Development at the University of Edinburgh. With a background and interests in genomics, Djikeng brings to his new appointment a wealth of experience in developing and leading biosciences research and development and capacity building programs across agricultural development and public health initiatives. The Centre for Tropical Livestock Genetics and Health was established to build on the world-class research expertise of its partner institutions, ensuring the development and deployment of genetics and genomics technologies to improve livestock productivity and livelihoods in the tropics. 20 April 2017—The Biosciences eastern and central Africa-International Livestock Research Institute (BecA-ILRI) Hub is set to play a key role in implementing World Bank funded Eastern and Southern Africa Higher Education Centers of Excellence Project (ACE II) initiative. As a technical partner to four East African institutions (Egerton University, Kenya; Sokoine University and Nelson Mandela African Institution of Science and Technology, Tanzania; and Makerere University, Uganda), the BecA-ILRI Hub will provide technical backing and support the strengthening of capacity for researchers from national institutions through fellowships and workshops. The ACE II is the second phase of an initiative first launched in West and Central Africa. The new phase will be implemented in 24 centers across eight countries—Ethiopia, Kenya, Malawi, Mozambique, Rwanda, Tanzania, Uganda and Zambia—and seeks to build research capacity in five regional priority areas: agriculture, applied statistics, education, health, and industry (science, technology, engineering and mathematics or STEM). The Kenya chapter of the initiative was officially launched by Education Cabinet Secretary Fred Matiang’i earlier this month. Already, Egerton University has advertised calls for applications for Masters and PhD Scholarships in sustainable agriculture and agribusiness management to be conducted in part at the BecA-ILRI Hub. Other Kenyan institutions participating in the project are Jaramogi Oginga Odinga University of Science and Technology focusing on sustainable use of insects as food and feeds; and Moi University focusing on phytochemicals, textiles and renewable energy (PTRE). Through this project, each center of excellence will receive USD 4.5–6 million over five years. With this funding, the centers are expected to achieve higher institutional capacity for quality education and advanced research; enhanced national, regional and international research partnerships for increased impact; and improved institutional management. The Centre of Excellence in Sustainable Agriculture and Agribusiness Management (CESAAM) at Egerton University (Kenya) and funded by World Bank is modelled to contribute to sustainable agricultural and agribusiness management through capacity development, research and technology transfer for enhanced food security. It offers fellowships to support students' training and research in relevant fields including Agricultural Economics and Agribusiness Management, Animal Sciences, Crop and Soil Sciences, Dairy and Food Sciences. Applications are invited for Masters and PhD Scholarships for programmes commencing in August 2017. The awardees for the MSc programmes will be on a two year full time study while the PhD awardees will be on a three year full-time study programme. After five days of intensive experiential learning at the BecA-ILRI Hub, six laboratory technologists from the Democratic Republic of the Congo (DRC), Kenya, Tanzania and Uganda were equipped with skills that will enhance their capacity to support scientists, teach and design research at their home institutions. The training for technologists, conducted by the BecA-ILRI Hub from 27 February–03 March 2017 at ILRI’s Nairobi campus, is a deliberate effort to enhance support to emerging science leaders in national agricultural research systems (NARS). Every year, the BecA-ILRI Hub offers fellowships to over 50 NARS scientists through the Africa Biosciences Challenge Fund (ABCF) program. These scientists enhance their skills and knowledge in research, and receive mentorship in science leadership and resource mobilization. There are however, limited opportunities for laboratory technologists and technicians in most African NARS, to upgrade their skills in tandem with the researchers. This poses a real challenge in getting effective support to sustain advanced research by ABCF research fellows on returning to their home institutions. During the 5-day training, the technologists experienced hands-on learning while embedded within diverse, ongoing research projects by ABCF research fellows. ‘I have learnt how to use equipment available at my home institution but which lack staff trained to operate them,’ said John Mshanga from the Nelson Mandela African Institution of Science and Technology in Tanzania. ‘Through this workshop I have also made so many useful contacts,’ said Winnifred Akech from Makerere University, ‘I now know that there is support for me and the students I assist, beyond this workshop,’ she added. The pilot training will help the BecA-ILRI Hub to better understand the capacity gaps in agricultural bioscience research support in African NARS. ‘Our alumni are key drivers of change within the NARS,’ said BecA-ILRI Hub capacity building senior scientist, Wellington Ekaya, adding that they can only be effective researchers and change agents if supported by technologists with the necessary capacity.